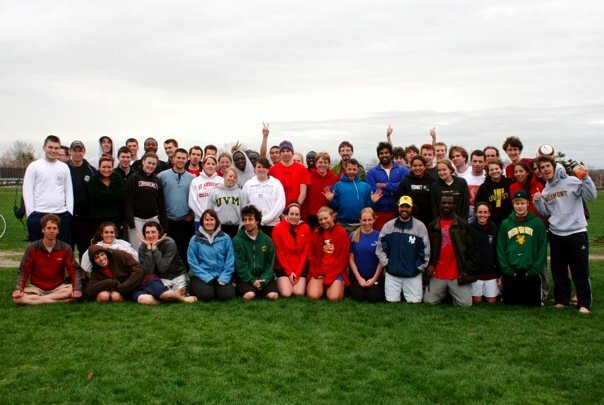 The 3rd University of Vermont “Lose the Shoes” soccer tournament went off on a snowy December 7th in Vermont. While only a few “futbolistas” braved the indoor tennis courts without shoes, over 15 teams got together for a 3 v. 3 tournament and fundraiser that is quickly becoming a fall semester tradition. UVM students raised money to support Futbol para la Vida, an HIV/AIDS prevention education program in the Dominican Republic that is part of the international Grassroot Soccer network. “Abazos” to Matt Linder for organizing the tournament, and to all the UVM students who trudged to the gym on a cold Sunday morning just before the last week of classes.